Dr. Kumar was born in South India but grew up in Philadelphia, PA and moved to the Nashville area to be closer to her parents. At a very young age, diabetes had a significant impact on her family’s life and opened the doors to podiatry. Her undergraduate studies were split between Villanova University and Alderson Broaddus College in West Virginia. Her desire to pursue her love for surgery and medicine led her to Cleveland, OH, where she completed 4 years at the Ohio College of Podiatric Medicine. In June 2013, Dr. Kumar graduated from the 3 year Atlanta Veterans Affairs Residency program with a PMSR Reconstructive Rearfoot and Ankle certificate. 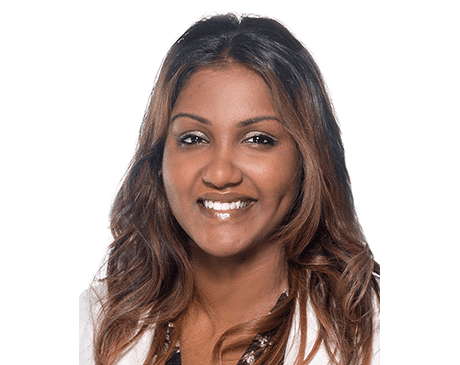 During her residency, Dr. Kumar was given the opportunity to lecture at national and regional podiatry conferences as well publish podiatric literature. Dr. Kumar credits her husband Jonathan, her family, and most importantly, God’s guidance for helping her achieve her goals. Her greatest achievements to date have to be the births of her sons, James and Judah.